ellehermansen: Who is the FIFA All-Star of 2010? Paul The Psychic Octopus! Who is the FIFA All-Star of 2010? Paul The Psychic Octopus! Today, over some delicious Vietnamese dinner with the family, the fact of the German Oracle Octopus came up in the discussion. 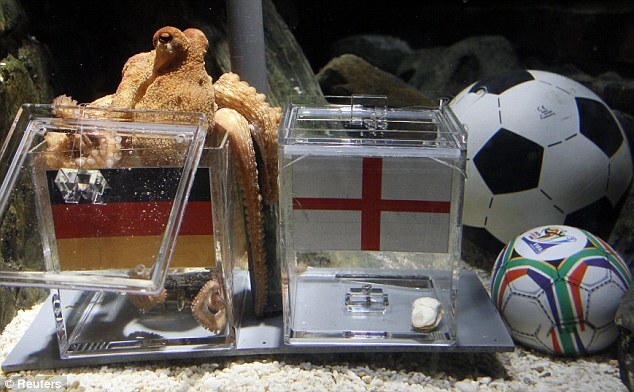 If you can wrap your head around this, Paul the Octopus can tell the future with his Psychic predictions of each game played by Germany - and this wonderful sea creature has only been wrong once - through 2 major championships! He even called that Spain would win over Germany, which the German people, naturally, didn't like so much. I have such a fascination and respect for these animals (click and scroll down to an amazing octopus video I posted a while back), even though my first trimester made me want to puke with the very thought of one swimming on the Discovery channel. If you wanted to know a little more about this amazing underwater sensation; check out the Top 10 list of things to know about Paul. He is pretty wonderful!